Some signs that a parking lot requires attention are quite obvious, like when pavement has eroded beyond the point where it can be fixed by simple patching. When a property owner allows the striping to fade to the point where parking spaces are indiscernible, that’s another indication parking lot maintenance may be lacking. Some less obvious symptoms of deterioration discussed below may be resolved with interim maintenance. With its low cost and relative ease of application, asphalt is the substrate of choice for over 90% of all parking lot construction. While asphalt is somewhat durable and withstands temperature fluctuations better than concrete due to its flexibility, traffic, leaked oils, harsh weather, and even atmospheric influences will eventually play a role in degrading the surface to the point that repair or replacement is necessary. Asphalt will eventually begin to erode and break down to the point where a repair is no longer an option. Old asphalt succumbs to age by reacting to atmospheric oxygen, photochemical effects of solar radiation, and excessive heat. As a result, the material loses some of its oily components, oxidizes, and loses its natural molecular integrity, becoming brittle. 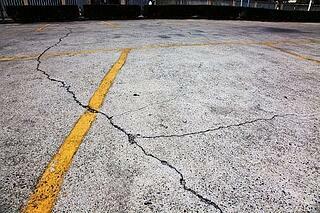 Cracks: Inevitably, even the most well-designed parking lots will begin to show cracks. Cracks arise for a variety of reasons, including exposure to excessive heat and cold and oxidation. Without a quick responsive fix to fill or seal the cracks, moisture enters the cavity, further weakening the subsurface. Applying and filling immediately with a sustainable sealant like BioSealcoat®, which is made with the low-VOC renewable resource soybean oil, is an effective solution. Raveling: When the stone material in the asphalt begins to break loose and surface, the asphalt may be beyond sealing. In this case, resurfacing or replacing the entire lot might be the only option. Standing Water: Puddles lingering long after the last rainstorm usually indicate a poor drainage system. This will cause consistent headaches if not properly addressed. An expert should inspect the lot to find drainage solutions. In many cases, regrading—or even a partial new surface—is needed to correct the problem. Chemical Spills: Parking lots are used by all types of vehicles, not just the latest models of highly engineered automobiles and trucks. Some vehicles leak oil, gas, and other fluids that are notably damaging to asphalt because of their chemical makeup. These substances quickly break down new asphalt and cause long-term issues if they’re not taken care of immediately. Regularly inspect your lot and clean spilled vehicle fluids to reduce damage. Faded Striping: If customers are parking at odd angles and taking up more than one space, your striping may not be visible enough. Assuming the pavement is still in good shape, restriping parking stalls is a relatively easy fix. In this case, consider using sustainable BioStripe® marking paints, which are produced from soybean oil, an environmentally safe and renewable resource. These marking paints have also proven themselves to be both economical and durable, maintaining their bright appearance longer than traditional waterborne paints. In the free downloadable eBook, The New Sustainability Frontier: Parking Lot and Road Maintenance, BioStripe® has defined the challenges and identified many solutions for the future of parking lot and road pavement.